Now He Can Attend Brock. Language is important to me. “Lanugage is important to me”. I’m pretty sure there’s some irony in there. I REALLY REALLY REALLY LOVE LANGUAGE. It amazes and astounds and amuses me daily. I’ll listen to a random stranger say something to another stranger and totally geek out on how intelligent they are, conveying thoughts with words, and then translating the words of others into thoughts. Then there are days when “your dog got mites at the pet shop, you should take this vet bill to them” seems too complicated a sentence for people, and I despair for humanity. But mostly, language delights me. So I’ve been waiting, waiting, waiting for Owl to get into language. Long before I got pregnant I was watching videos on teaching babies to read, and I totally wanted to teach my baby to read. Not because I’m a pushy mom, who thinks it’ll help her kids get into a better college. I doubt it’ll give any real head start. Just because IT’D BE REALLY COOL. My friend who I’m starting a dog training biz with actually worked under this lady, so she’s going to show me how to teach Beloved Dog to read. I figure we can do Owl at the same time because he is FINALLY ready for language. He started pointing at 8 months, and so I started sign language then, but the only word he picked up was “milk”, and that was a behaviour that I captured with positive reinforcement, not something he picked up through imitation and a desire to communicate. He did pick up the sign for “ball” shortly before his first birthday, but that was it. Not even a “mama” until after 13 months. It wasn’t until daycare that he picked up another sign – “more” – (and sadly, it’s the wrong version – the sign for “again” instead of the real sign for “more”, but whatever) and even then, language didn’t start. My mother assurred me a month or two ago that as soon as Owl began to walk, the talking would start. “Mama” appeared less than a week after he started walking, and now he is learning a sign every couple of days and really TRYING (and failing) to approximate the word sounds. His sign vocabulary includes: “milk”, “ball”, “more/again”, “dog”, “cat”, “duck”, “frog”, “book”, and “bear” (sort of). 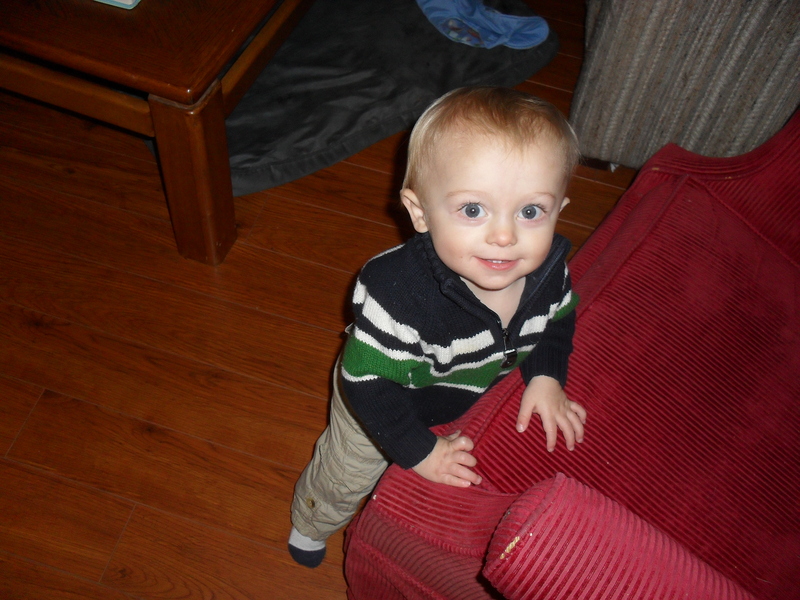 His spoken vocabulary consists of: “mama?” “dada?” “baaaaaa”, “daw?”, “daa”, and “duh”. Only truly doting parents would understand most of these, but then, we’ve always been eager to interpret his sounds. Language has begun and I’m SO STOKED. Hey, walking and talking are difficult things, especially to do at the same time. 😉 Sometimes I struggle with it. Granted, only if I’m walking at too brisk a pace. Hehe. We started working on a couple of signs with Jonah, on the speech pathologist recommendation. He definitely knows “more” and we’re working on others. I’m excited to see him express himself, since the speech thing is lagging. We’ll get there eventually!